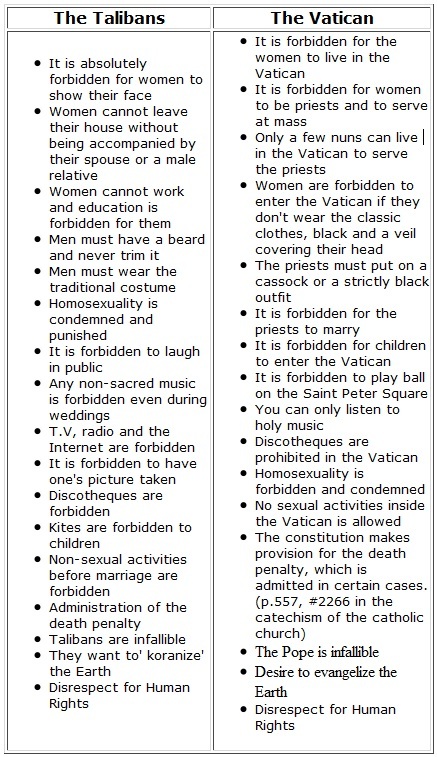 The Vatican and its laws are every bit as bad as the Talibans! Would we have double standards? Today, everybody agrees to condemn the Talibans and yet they support the Vatican without realizing that both of them run a theocratic and dictatorial regime! Neither of them respect Human Rights, and on a theological and ideological level, they both have moral laws similar and comparable in every respect! The comparison between the two theocratic regimes!